Happy Birthday to all you slots online enthusiasts. 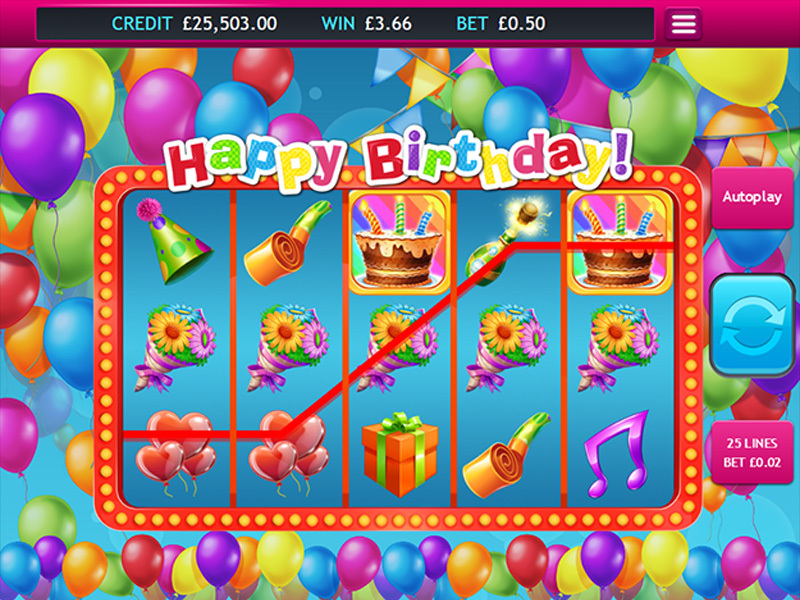 This online slot 5 reel allows it to be your birthday 365 days a year, 24/7. Enjoy this early birthday present and spin the wheel and watch the balloons sore as you win some spectacular free spin bonuses. This title was developed and published by EyeCon, an Australian company that delivers great titles to the casino gaming market since 1997. 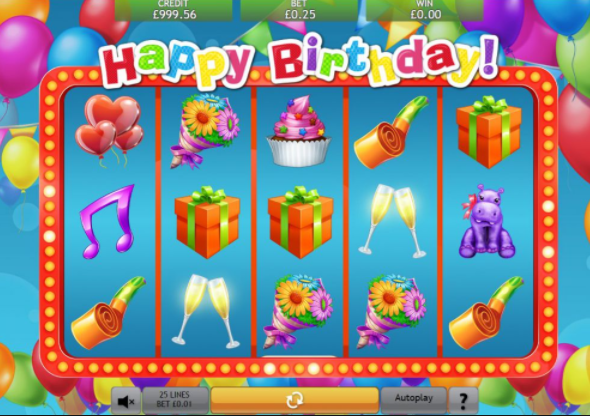 Slot games like Happy Birthday are what made them famous in the digital gaming sector, with over 100 titles in their portfolio, all of them being designed for entertainment, with stunning graphics and top-notch gameplay and animations. Getting you to enjoy every single spin is their focus, as this game-development company has invested a lot in highly-skilled professionals specialized in 2D and 3D graphics. This game delivers a high level of entertainment within a clear, concise and crisp design. If you want to know about EasySlots promotions, click here to read more. Is it your birthday? Well, “NO” is not an answer because we are all dressed up and in a festive mood to celebrate you! 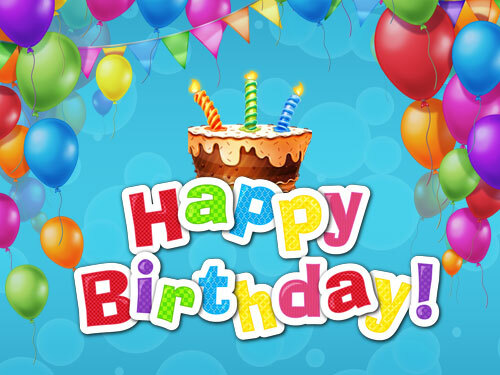 Your gifts are many, fantastic, and there for you to open them as you spin & win while we sing Happy Birthday to you! Carefully designed, to engage the user in a festive atmosphere, this game delivers a unique, relaxing, attractive and festive atmosphere to spin & win in. Chances are that you will get whatever you want on your birthday, as there are lots of prizes at stake on this one, all cheerfully packed for you. Let’s get the party started, spin now and enjoy winning! Surprise! We’ve arranged everything for you, we have a room full of colorful balloons in the background and don’t you bother bringing anything because we have everything sorted for you to enjoy; party hats, cupcakes, flower bouquets, streamers, heart-shaped balloons and many gifts are there for you to enjoy on this 5-reels, 25 pay-lines slot machine game from EyeCon. We felt like it is our birthday with this one, feeding the festive spirit that lays in each and everyone of us, and delivering bundles of joy as we went on spinning and winning in this colorfully designed slot game from EyeCon. Don’t take our words for granted, because today it’s your birthday, so go and smash that spin now button with Happy Birthday slot game! An equally robust game for you to try is Eggomatic.